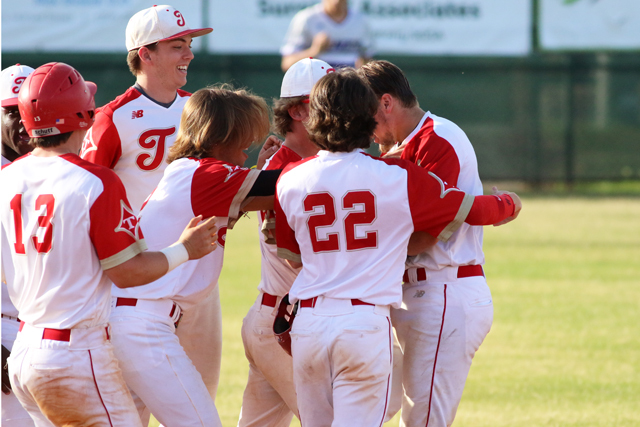 Thomasville players celebrate after defeating Fitzgerald in a Region 1-2A game on April 12. The Bulldogs swept a pair of games from Fitzgerald and won the Region 1-2A title. Editors Note: Coaches are encouraged to submit their week's best performances to be included in this column each week. Submissions (by school officials only), must be submitted by 10 a.m. each Sunday to be included in the notebook. Submissions must be sent to georgiabaseball2006@yahoo.com. Playoff talk will dominate the final week of the regular season this week. A handful of regions have already completed region play and their seedings are finalized for the state playoffs. The first round for all classes begins on April 24. Houston County (Region 1-6A), Heritage-Conyers (Region 3-6A), Winder-Barrow (Region 8-6A), Harris County (Region 1-5A), Decatur (Region 6-5A), North Oconee (Region 8-4A), Appling County (Region 2-3A), Benedictine (Region 3-3A), Pike County (Region 4-3A), Thomasville (Region 1-2A), Harlem (Region 4-2A), Bremen (Region 5-2A) and Rockmart (Region 7-2A) have already claimed region crowns and the No. 1 seed in their respective regions. Class 1A (Public and Private) seeds its teams by power rankings. Those seedings won't be announced until after the final day of the regular season ends on April 21. MILESTONE COACHING WINS LAST WEEK: While Saint Anne-Pacelli coach Bobby Howard (1,000th win) and Pope coach Jeff Rowland (500th win) dominated the high school coaching talk last week with their milestone victories, a handful of other coaches topped the 400-win mark. Valdosta High School coach Brad Porter swept Coffee on April 5 for his 400th career win. In a 2-1 victory over Swainsboro on April 10, Jeff Davis head coach Paul Glass notched his 400th career victory. A pair of other coaches, Kennesaw Mountain's George Hansen and Starr's Mill's Brent Moseley recently recorded their 400th coaching victory. NORTH GWINNETT IN COMMAND: North Gwinnett took two of three games from Mill Creek last week in Region 6-7A play. The Bulldogs need just one more victory to capture the region crown and the region's No. 1 seed in the playoffs. North Gwinnett topped Mill Creek 5-1 on April 8 behind Brandt Pancer's complete game. Jayden Perrine went 4-for-4, while Will Bennett went 3-for-4 to lead the offense. The Bulldogs took an 8-2 win on April 10 as Jarrett Burney (3-for-3, 2 RBIs) and Chase McCulloch (2-for-2, 2 RBIs) helped pitcher Coulson Buchanan earn the victory on the mound. But Tim Simay (3-for-4, 2B, RBI) and Alek Boychuk (2-for-5, homer, four RBIs) helped Mill Creek to a 14-7 victory on April 11 to avoid the sweep. HILLGROVE TAKES 2 OF 3 AGAINST NORTH PAULDING: After taking two of three from North Paulding in a key Region 3-7A series last week, Hillgrove needs just one more victory to win the region title. The Hawks open a three-game series against North Cobb on April 15. On April 9, North Paulding pitchers Zach Maxwell and Tyler Roon combined to allow Hillgrove just one run on two hits in a 3-1 victory. Maxwell struck out nine in six innings, while Roon worked a scoreless seventh for the save. Mickey Maguire, Peyton Moseley and Cole Dunn had two hits each to lead the North Paulding offense. But Hillgove's Reid Brown scored the go-ahead run on a single from Trace Cate in the top of the seventh to help the Hawks to a 3-2 win on April 10. Alex McKay earned the victory in relief of starter Deion Walker. The Hawks took the final game of the series 6-3 on April 11 behind Ethan Wright's 3-for-4 performance at the plate. The senior had a double and an RBI in the game. WALNUT GROVE, BUFORD SPLIT: Walnut Grove is making the rugged Region 8-5A race interesting. The Warriors, under first-year coach Carl Allen, split with former No. 1 Buford last week. The Warriors took a 2-1 victory on April 10 as pitcher Austin Little outdueled Buford's Dylan Lesko. Lesko struck out 12, but he fell on the short end in a strong complete-game performance. Little allowed one run on three hits, while Lesko allowed two runs on three hits. Chandler Head went 2-for-3 to pace the offense for Walnut Grove, while Eli McMullen had a double. But Buford rallied for a 2-1 victory on April 10 when Riley Stanford scored the go-ahead run in top of the seventh on Lesko's bunt. Ramsey David allowed just a run on a hit and struck out nine in a complete-game pitching performance. He outdueled McMullen, who allowed two runs on five hits in a complete-game outing. Austin Turner and Evan Place had two hits each to lead Buford. Walnut Grove, which entered the state rankings this week for the first time this season at No. 10 in Class 5A, has three games left. They play host to Johnson-Gainesville on April 15 before closing the regular season with a pair of games against top-ranked Loganville. DECATUR CAPTURES REGION 6-5A CROWN: Decatur had a strong week, defeating Maynard Jackson 13-0 and sweeping a pair of games over previous Class 5A No. 5 Riverwood to win the Region 6-5A crown. In a 4-2 victory on April 10, pitcher Jaylen Paden earned the victory on the mound, going 6 2/3 innings allowing two unearned runs on two hits and striking out eight. Tucker Jones worked the final out for the save. Paden outdueled Riverwood ace and South Carolina signee Brett Thomas, who struck out 12 batters in the complete-game outing. Paden was the winning pitcher and also had an RBI double. The Bulldogs defeated Riverwood 6-3 in eight innings on April 12. Paden and Jordan Walker each went 3-for-4 at the plate, while Robbie Huey went 2-for-4. Walker had a double, a two-run homer and four RBIs. He and Eddie Galatas combined to allow Riverwood just two hits on the mound. Galatas earned the victory in relief. HARRIS COUNTY TAKES TWO FROM TCC: Harris County swept Thomas County Central in a doubleheader on April 12 to take the Region 1-5A crown. Harris took the first game, 1-0, when Cayden Frost's walk-off RBI single in the bottom of the seventh scored Dylan Potteiger. Frost and Cole Stanford each had two hits in the victory. Cole Mathis earned the victory on the mound, working six innings and allowing five hits. Daniel Miller worked a scoreless seventh for the save. The Tigers, who defeated Thomas County Central, 7-0, on March 8, didn't need a victory in the second game of the doubleheader to secure the region title. They still took a 5-2 victory. The biggest blow was a bases-clearing double from Stanford in a three-run third inning that gave the Tigers the lead for good. WOODWARD ACADEMY HEATING UP: After Eastside defeated Woodward Academy 4-1 on March 20, Woodward Academy got even in a key Region 4-4A game on April 12. Woodward pitcher Will Sanders allowed two runs (one earned) on three hits and struck out eight as the War Eagles topped Eastside 9-2. Eastside was previously ranked fourth in Class 4A. DA Allen, Allen Thompson and Khari Gee had three hits each to lead the Woodward offense. Allen and Thomspn finished with thee RBIs each. Allen had three doubles. PACE ACADEMY HOT: Pace Academy has won nine straight, but perhaps none were as big as last week's three victories. The Knights swept a pair of games from Redan, previously ranked No. 2 in Class 3A. Then they topped Westminster on April 12. Bennett Treadway scored the game-winning run in a 9-8 victory over Redan on April 9 on an RBI single from Jae Williams. Andrew Jenkins had a three-run homer and Brian Zeldin had a two-run double to highlight the Pace offense. Zeldin earned the victory on the mound in relief. Tyler Williams went 3-for-4 for Redan. Jenkins finished with two hits, including a homer and four RBIs, while Jayden Thomas added two hits an an RBI to help Pace defeat Redan 11-8 on April 10. Yereny Batista had two homers for Redan and three RBIs, while Branden Lamback and Kevin Kilpatrick finished with two hits each. Kilpatrick had a double, a homer and two RBIs. The Knights weren't finished there. They scored three runs in the top of the sixth, then held on to top Westminster 5-4 on April 12. Jenkins went 2-for-3 with a homer and three RBIs, while Duece Jordan and Zachary Howard finished with two hits each. Mitchell O'Berry earned the victory on the mound in relief of Zeldin. Jenkins worked the final out for the save. The loss spoiled a 3-for-4 performance at the plate from Westminster's Luke Jannetta. Perhaps no team has a tougher week in the state than Pace Academy. The Knights play host to Westminster on April 15, then finish the season with a pair of games against Lovett on April 17 and 18. LOVETT PEAKING AT RIGHT TIME As usual, Lovett is playing its best baseball at the end of the regular season. The Lions swept a pair of games from Westminster last week, then took down Redan on April 12 in Region 5-3A play. Trailing by five runs in the top of the sixth against Westminster on April 10, the Lions scored seven runs, then held on for a 7-5 victory in a rematch of last year's Class 3A state championship series that Lovett won. Mike Valis' two-run double broke a five-all tie in the sixth. Schaefer Jackson and Will Seiler had two hits apiece to lead the Lions' offense. The momentum carried over against Westminster on April 11 when pitcher Lance Beck's complete-game one-hit shutout helped the Lions to a 3-0 victory. Lovett then topped Redan 5-2 on April 12 behind pitchers Dhruv Patel and David Underwood, who combined to allow just two runs on five hits. Jackson finished 2-for-4 with a double to lead the offense. SCHLEY HAMMERS BACONTON: In a matchup of No. 2 vs. No. 3 in the GHSA Class 1A Public rankings, No. 2 Schley County swept a pair of wins over No. 3 Baconton on April 11. The Wildcats won 11-1 behind pitcher Dylan Taylor who allowed one unearned run on two hits in five innings. He struck out eight and also went 1-for-3 with a two-run double. Trent Bivins went 2-for-3 with two RBIs. Schley then won the second game 5-1. Pitchers Garrett Peavy, Lorne Barineau and Bivins combined to allow just one unearned run on three hits. Dylan Windham went 2-for-4 with two RBIs. BAD WEEK FOR BACONTON: Not only did the Blazers lose a pair of games to powerhouse Schley County, Baconton Charter lost a 4-3 decision in eight innings to Seminole County in Region 1-1A play on April 9. The Indians scored a pair of runs in the bottom of the eighth after Baconton had taken a one-run lead in the top of the eighth. Chase Smith earned the win in relief of starter Aubrey Johnson. Jacob Jarvis went 2-for-4 to lead the Seminole County offense. Seminole has won 14 straight games. ETC., ETC. : Irwin County's Brodie Chestnutt struck out eight and allowed one unearned run on one hit in a 3-1 victory over Clinch County on April 9. ... Two games last week went deep into extra innings -- Trinity Christian needed 13 innings to defeat Mount Vernon Presbyterian 19-17 in a key Region 5-1A matchup on April 11. On the same night, Lambert defeated North Forsyth 3-0 in 12 innings. ... A huge three-game series in Region 8-3A begins April 15 in Madison as Class 3A No. 1 Jefferson meets No. 2 Madison County in Madison. The final two games of the three-game series will be played in Jefferson on April 19. The doubleheader starts at 5 p.m. ... In Class 4A, another No. 1 vs. No. 2 series will take place when top-ranked Blessed Trinity meets No. 2 Marist. The teams play at Marist on April 17, then at Blessed Trinity on April 18. Editors Note: Here are this week's weekly submissions from schools. Please note these items are submitted by schools and team administrators. Parkview won a pair of region games over Lakeside-DeKalb to improve to 22-4 on the season. Xander Stephens earned a victory on the mound, throwing six innings and allowing no runs on two hits and striking out nine. Cameron Orr also earned a pitching victory. In three innings, he allowed no runs on two hits and struck out two. On offense, Noah Brown combined to go 5-for-7 with a double and two RBIs. Makenzie Pate combined to go 3-for-6 with two homers and four RBIs. Walton scored a 7-6 victory over Lassiter on April 10, then split a doubleheader with the Trojans on April 12. Walton improved to 17-8-1 and took a giant step toward capturing the Region 4-7A title. In the second game of the season, Mac Williams and Pierce Gallo had multiple hits. The Raiders won the final game of the series, 8-5, in 10 innings. Bobby Spencer had two hits and three RBIs, including a two-run double to break a 5-all tie. Spencer later scored on a passed ball. The Raiders had strong relief pitching from Jacob Baldino, Brandon Nikitaides and AJ Montijo. Woodstock went 2-1 last week against Cherokee and is 17-10 on the season. In a 3-2 victory in the first game of a doubleheader on April 12, pitcher Josiah Siegel earned the complete-game win. He allowed eight hits, two earned runs and struck out 11. Brennan Milone combined to go 4-for-8 on offense with a homer, scored five runs and walked twice. He earned the victory in relief in the final game of the series when he threw 4 2/3 innings. Apalachee is seeking to earn its first trip to the state baseball playoffs in the school's history. The Wildcats are 15-12 and need just one more win to break the school mark for most wins in a season. They won 15 games in 2018. Two weeks ago, Apalachee won its first region series in school history defeating Gainesville. Pitcher Hunter Parks beat Gainesville 8-4 at home in Game 1. Chase Chancey and Alex Cook each homered to lead the offense. Cook threw a three-hit complete-game shutout on the road to beat Gainesville 12-0 in Game 2 of the series. The Wildcats had 14 hits in Game 2. Gainesville rallied late to win Game 3 of the series with a score of 6-5. The Wildcats won their second region series of the year against Lanier High last week. Parks beat Lanier 6-3 in Game 1. Cook threw a complete game ho-hitter to win Game 2 of the series, 5-0. Cook also added another homer to lead the offense. Game 3 was an instant classic that saw Lanier win 5-4 . The Wildcats' 6-foot-5 freshman pitcher Manning West left the game in the sixth inning with a 4-3 lead, but Lanier rallied late to win 5-4. Richmond Hill improved to 20-6 on the season after sweeping a trio of games from Glynn Academy. The Wildcats were led offensively by Bucky Bayens (six hits, seven RBIs), Leighton Finley (six hits, four RBIs), Brandon Becker (six hits, three RBIs) and Cameron Gilkey (four hits, five runs). The Richmond Hill pitching staff allowed just a combined three earned runs and fanned 23 in 19 innings. Thomas County Central is 22-4 on the season after going 1-2 last week with a victory over Tift County and a pair of losses to Harris County. Nick Herndon went a combined 5-for-9. Even though he did not pick up a victory in a loss to Harris County on April 12, pitcher RJ Delaney allowed no earned runs on six innings. He allowed seven hits, one walk and three strikeouts. Cairo is 21-3 and perhaps no hitter in the lineup was as hot as third-baseman DJ Collins. He batted .571 last week in victories over Dougherty (twice), North Florida Christian and Berrien, and he's currently hitting .507 on the season. He has a double and a triple against Dougherty and smashed a three-run homer against North Florida Christian. Dawson County went 1-2 against East Hall last week and is 8-12 on the season. Junior outfielder Hudson Sapp combined to go 9-for-12 at the plate with a homer, two triples, three doubles, seven RBIs and scored six runs. Pitcher Cameron Moore, in a 10-2 victory on April 11, allowed one hit in 6 1/3 innings. He allowed no earned runs and struck out seven. Greater Atlanta Christian went 2-1 last week, taking two of three in Region 7-3A play against Cherokee Bluff. Sophomore Jacob Fairbanks combined to go 6-for-11 with two doubles, two RBIs and scored six runs. Sophomore Brooks Miller went a combined 5-for-11 with a double and two RBIs, while Wofford signee Shane Lussier combined to go 6-for-14 with a double, a homer and eight RBIs. On the mound, Presley Field hurled six innings and allowed three runs on six hits to pick up a victory. Junior Bryceton Payne struck out eight and allowed four hits in 4 2/3 innings. Greater Atlanta Christian is 12-10-1 on the season. Ringgold went 3-1 last week with victories over North Murray, Coahulla Creek and Murray County. They lost a nonregion game to North Paulding. The Tigers are 22-5 on the season. Andre Tarver combined to go 4-for-9 with a homer, triple and five RBIs. Daulton Schley went a combined 6-for-10 with a homer and nine RBIs. Holden Tucker combined to go 4-for-11, while Brayden Broome combined to go 4-for-9 On the mound, Tucker threw a five-inning shutout victory over Coahulla Creek allowing one hit and striking out 10. Mason Parker and McCain Mangum combined on a shutout against Murray County. Mangum also added a solo homer in the victory. Fellowship Christian split a pair of games with Saint Francis in Region 6-1A play last week. The Paladins are 17-6 on the season. Senior shortstop/pitcher Isaac Bouton (Columbus State signee) went 3-for-5 with a homer, two doubles and two RBIs in the victory on April 11. He also pitched 5 1/3 innings, striking out eight. Sophomore Matson Grose worked the final four outs for the save, including working out of a bases-loaded jam in the sixth. Outfielder Cody Tapley went 3-for-5 with an RBI, while junior shortstop Preston Joye went 2-for-3 with an RBI double. Saint Francis split a pair of games with Fellowship Christian last week. The Knights are 17-6 on the season. In a 3-2 victory over Fellowship Christian on April 11, senior pitcher Will Clark earned the victory allowing just three hits and a run in six innings for his sixth victory the season. Clark has 72 strikeouts this season and an earned run average of 0.92. Freshman Carter Davies worked the final inning for his third save of the season.